Yesterday I posted the first segment of my five day series of fall destinations where there are great views and great places to camp. 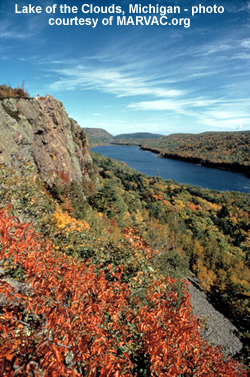 The first featured destination was Vermont. Today the focus is on the Midwest and the state of Michigan. Although the New England area boasts great fall color and scenic drives, the Midwest is gorgeous and colorful in the fall too. Color starts peaking in parts of the Upper Peninsula in mid-September and into early October. There is typically good color in parts of Michigan until the end of October. The Michigan Travel and Tourism website has fall color updates and a list of several color driving tours all around the state to help make sure you don't miss the great color no matter what part of the state you want to visit. For color reports specifically in the Northern part of Michigan and in the Upper Peninsula, go to the NewsUpNorth website. 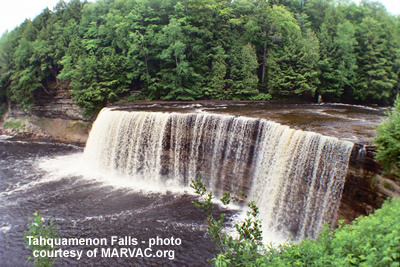 They also feature some great fall driving tours, one of which features Tahquamenon Falls State Park. TAHQUAMENON FALLS STATE PARK - THE UPPER PENINSULA Tahquamenon Falls State Park in the Upper Peninsula of Michigan has a lot to offer. 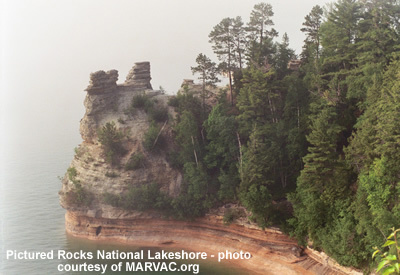 It has two of the best waterfalls in Michigan, 40 miles of hiking trails, and 13 inland lakes amidst its 45,000 acres. It's a great place for camping, hiking, fishing, canoeing, fishing, viewing the colors of autumn and a great place to take pictures (sounds like it would be pretty hard to get bored there doesn't it?). There are 4 campgrounds in the park with rustic sites to modern sites that have electrical hookups. The park is open year round and there are heated restrooms by the modern campsites. For more information on camping or to make a reservation go the Michigan DNR website. For a fun fall activity at Tahquamenon Falls State Park, attend the Harvest Festival at the park on October 17 and 18, 2008. There will be pumpkin carving, hayrides, costume contests, trick or treating and a walk through the "Haunted Trail in Paradise." And, to see what the park is like for yourself without having to leave home or spend a penny on gas, check out this Webshots slide show on Tahquamenon Falls State Park. TRAVERSE CITY Traverse City Michigan is a popular destination in the summer and is also a great fall destination. 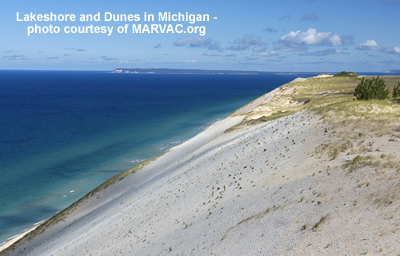 There are two great scenic drives in the area recommended by the Michigan Heritage Route Program . One is 64 miles long and goes from the Village of Empire on M-22 to the junction of M-72 just north of Traverse City. The second is easy on the gas tank at a little over 17 miles long and goes from the north city limits of Traverse City (just northeast of the Peninsula Drive and Center Road Intersection) to the northern terminus of M-37 at the Old Mission Lighthouse. For more information on both drives visit the Michigan Highways website and look under the "Scenic Heritage Routes" section. For a place to "park your wheels" check out Timber Ridge RV & Recreation Area at 4050 Hammond Rd. Traverse City, Michigan. They have camping facilities for for RV's, tent campers, and cabins for those that don't want to bring their camper or RV with them. They also have several miles of trails for hiking and biking. 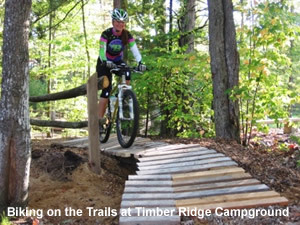 On October 10 and 11, 2008 they are having a guided mountain bike ride where cyclists can enjoy the crisp fall air and colorful scenery on the Timber Ridge trails. Click here for more information. 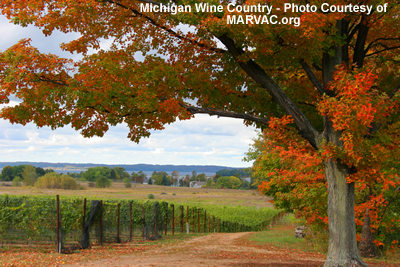 While in the Traverse City area, why not take a side trip to visit a Michigan winery or two and to sample some wine (sounds like fun to me!). Chateau Chantel is just 12 miles north of Traverse City on M-37. They are open daily, year round (except for some holidays) and offer complimentary wine tastings. And, to bring back carefree childhood memories, kick off your shoes and run down the sand dunes on the shores of Lake Michigan. And to learn more about camping and rv'ing in general and to discover more great destinations to visit in Michigan check out the Michigan Association of Recreation Vehicles and Campgrounds website (MARVAC.org). Truly immerse yourself in everything Michigan has to offer and make a point of experiencing all 10 things on their "Top Ten Michigan Experiences." I've done a few of them (crossed the Mackinac Bridge - a scary thing because I hate bridges, tasted a Michigan tart cherry - yum!, biked Mackinac Island - lots of fun because we rode a tandem bike, and watched freighters pass through the Soo Locks). While Michigan isn't at the top of most people's "places to visit," it should be. There's so much to see from the gorgeous lakeshores, to the many rivers and lakes, to the vast forests, to the cities like Detroit (the hub of American automobile manufacturing), and to places like Mackinac Island where visitors take a step back in time when there were no motorized vehicles. Transportation on Mackinac Island is via horse, bicycle, or your own two feet (no noxious gas fumes found there!). While I admit Mackinac Island has gotten "touristy" it's still a great place to visit. To get away from the crowds so that you can enjoy the beauty of the island, get away from town and onto the state park land trails (80% of the island is park land). And, if you're a history buff and enjoy getting a glimpse back into days gone by, check out this video from YouTube that I found while researching this article. It's a circa 1949 documentary about Michigan (a short one - less than 9 minutes long). It's a neat trip back in time (check out the hairstyles and the don't miss the segment on the "bear man of Michigan"). For a more modern day look at Michigan and its beauty check out this video from a former Michiganite who misses it (snow and all).